The noblest variety black Azorentee, sorting of the 1st leaf, beautiful hue, round flavor with caramel, fine scent. Must also take 5 minutes or longer, then unfolds its delicious taste most intense. 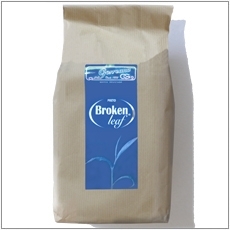 Black Azorean Tea, second leaf, robust, rich taste, dark colour, stimulating. Black Azorean Tea, third leaf, light colour, mild taste, beautiful every day tea, very agreeable even if consumed in larger quantities. 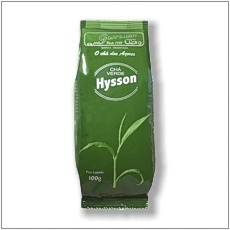 Economy pack of Black Azorean Tea, third leaf, light colour, mild taste, beautiful every day tea, very agreeable even if consumed in larger quantities. Big size economy pack. 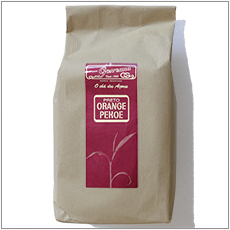 Saves expenses for all those who like to enjoy their daily cup of very fine Azorean Orange Pekoe from Chá Gorreana, grey low budget package. Big size economy pack. Saves expensenses for all those who like to enjoy their daily cup of strong Azorean Pekoe from Chá Gorreana, grey low budget package. Big size economy pack. 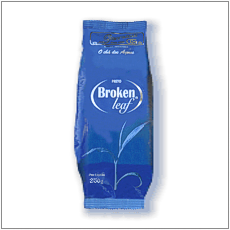 Saves expenses for all those who like to enjoy their daily cup of mild Azorean Broken Leaf from Chá Gorreana, grey low budget package. (Deutsch) Der fruchtig-frische grüne Azorentee in kostengünstiger grauer Einfachverpackung für alle, die ihren Hysson täglich genießen möchten. 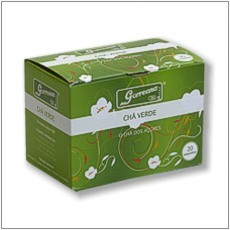 Premium green Azorean Tea, first leaf , beautiful distinct flower, reminding at Orange Pekoe, no tanginess even when steeped longer than 5 minutes. Black Azorean Tea, mixture of little bits and pieces of leaves left over after fermentation, no individual flavour, suited to give your tea a darker colour, only used additionally. 20 Tea Bags. 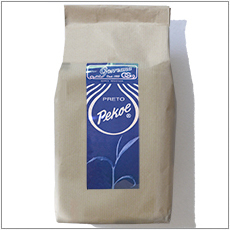 Pekoe blend, very handy when there is no time for a proper tea ceremony. 20 Tea Bags. 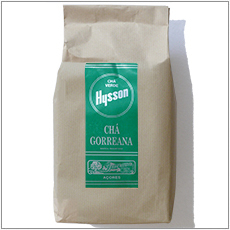 Hysson blend, a compromise to fast running modern life, very handy for a quick cup in between.